Doctors are online using HIPAA-compliant websites and mobile apps to see patients. This new process is called telemedicine. This technology is not only changing the definition of a “doctor’s visit,” but also the terms associated with a medical visit, thus the introduction of terms like telemedicine, teletherapy, and telepractice. We know adults with aphasia often acquire the disorder following a stroke. As a result, driving, walking, and traveling to a speech-language pathologist (SLP). However, access to these services is especially important in the first six months following a stroke. We used our backgrounds in technology, product development, and clinical expertise to create an online speech therapy service called TalkPath Live, so individuals with aphasia could seek speech therapy services from the comfort of their home. 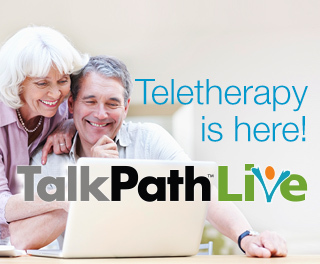 TalkPath Live is speech therapy delivered via online video. You can connect with our certified SLP for an initial clinical assessment. During the assessment, our SLP will check a your speech, language, and cognitive abilities. Afterward, you will receive a full report with our therapy recommendations. You can then select the number of individual sessions or a therapy program that fits your budget and speech needs. Currently, we offer TalkPath Live in 44 states, and we're adding more state licenses every day! We even conducted an outcome study to make sure TalkPath Live would be an effective and efficient treatment option for adults with aphasia. Our results are available in the full research study online.